I usually don’t capture the photo challenge so quickly once it’s announced, but yesterday was a beautiful sunny day at work. 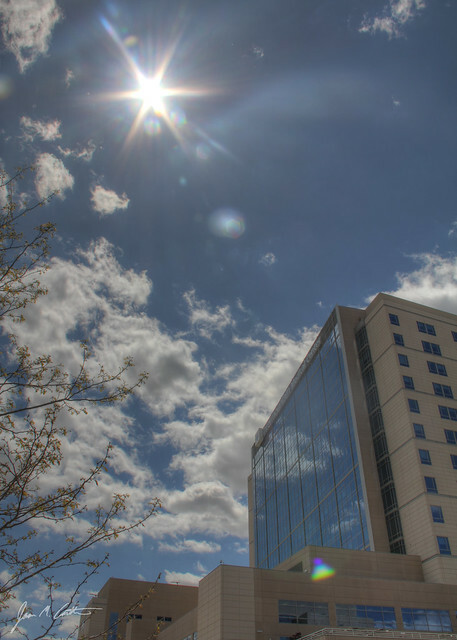 When I got back to Intermountain Medical Center from a lunch meeting, I figured the sun and building would make a great composition, so I set up the shot. However, I know that photographing the sun can cause havoc on proper lighting in a photo, so I figured I would go for the HDR setup again. I leaned up against my car so the camera would be still enough to grab three identical images, then processed it using Photomatix Essentials. I was really pleased with the outcome. It’s definitely something that shouldn’y be done often. A testament to the continued robustness of analogue photography. The makers of digital cameras still have their work cut out for them on this. Thanks for commenting and sharing your photo of the Sun. I always enjoy checking out everyone else’s interpretation of the challenge. Happy shooting.